Welcome to the world of Elena Sonnino! Our dear friend Elena is a life coach, yoga teacher, and speaker. She guides perpetually unsatisfied goal setters to celebrate what’s going right, tap into the now without judgment, and cultivate self-compassion to step into their potential. Her superpower is to be the mirror that helps you reveal what is already within you so that you can light up your own world. She offers gentle nudges and the occasional nurturing shove to help you get out of your own way and truly see yourself with more kindness and love and less expectation and judgment. Visit Elena’s website, read her thoughts on her blog, or gain daily inspiration on Facebook, Instagram and Twitter! What’s the story behind you and your passion for life coaching? What’s the story behind your business? I have always been a guide even when I didn’t realize it. The most fulfilling moments in my life were when I could create and hold space for others to find their own answers or discover their own lightbulb moments. 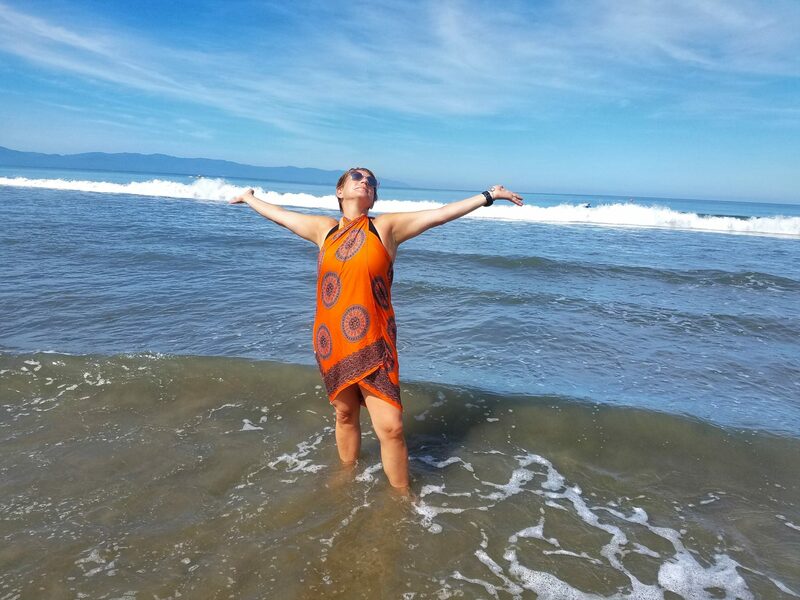 My journey to life coaching came one step at a time, first as an elementary school teacher and then as a wellness and travel blogger until finally, I realized that my heart always brought me back to holding space for others to find their own answers within themselves. Life Coaching found me on a massage table in Jackson Hole, Wyoming. The therapist and I were chatting about energy work and in passing, she asked me if I’d ever considered life coaching. Indeed – I had! But I’d never admitted it to anyone. The following morning I rode the gondola to the top of the mountain, only to step off the summit harnessed to my paragliding pilot and parachute. It was at that moment, soaring through the air with the birds and the clouds, noticing how it only took subtle movements to change direction – that I knew. It wasn’t about a destination as we flew. It was about noticing. It was about letting the wind move us and fully experiencing each shift with gratitude and wonder. By the time I reached the landing zone, I’d decided to embrace the nudges and set off to be a guide for perpetually unsatisfied goal setters to release their hold on expectations and outcomes with more intention, more self-compassion, and more self-acceptance. Since then I’ve added yoga and meditation to my life coaching work, to nurture and nourish the mind, body, and soul. In addition to my 1:1 life coaching work, I’ve launched my Go Beyond retreats to help women connect to their hearts and make more room for gratitude and play in their lives and my See You. Be You. retreat and group coaching program to guide women to see and be seen so that they can find the answers they’ve been searching for within themselves with more vulnerability, clarity, and love. Two things keep me inspired and give me bliss. The first is my 13-year old daughter. She has taught me more about living each day from the heart than any book or guru. She has always been intuitive and curious, but even on her teenage-angst-days, she reminds me to live big and love deeply. The second thing that gives me bliss and inspiration is water. The ripples of waves, the energy of the ocean, the reflections that appear over a lake are like medicine for my soul. What do you hope to share with your clients? How do your retreats benefit guests? My biggest hope for my work is that my clients find the stillness and self-compassion within themselves to recognize that everything they crave and want, already exists within them. Our deepest gifts are just lying in wait for us to clear away the clutter so that they have the space to emerge and bloom. Although I can never guarantee an outcome, I can always guarantee to show up with my intention and energy to create and hold space for clients to deepen their connection to themselves, to the now, and to the magic that comes from tuning in to their superpower. Travel and adventure are transformational when we open ourselves up to receive, without expectations. My retreats benefit guests by providing an atmosphere to play, to notice, to absorb all the feelings of joy and even vulnerability when we push ourselves to try new things. Do you have a favorite travel and/or retreat memory? What was it? Oh yes! I was on my first SwellWomen retreat. It was our third day I think. This was my first attempt at learning to surf, and by all accounts – I wasn’t very good. But our instructor suggested that I show up in the water with determination instead of expectation. So I paddled and caught waves on my belly until suddenly for just an instant – I was somewhat vertical on my board. The moment and feelings inside me surprised me so much that I didn’t know what to do – and proceeded to fall off the board with the most epic of belly flops and the biggest, most heart-filling smile ever. It was that moment that taught me what it truly felt like to let go of expectations and show up as my true self.